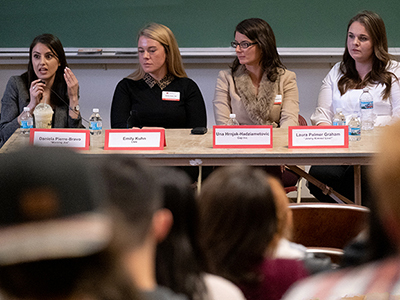 Four Miami University alumni participated in the university's annual 18 of the Last 9 event appearing in a panel for the Department of Media, Journalism & Film (MJF) on Thursday, October 25. The four panel members were Daniela Pierre-Bravo, producer at MSNBC's Morning Joe, Emily Kuhn, director of communications at CNN, Laura Palmer Graham, associate producer at Jimmy Kimmel Live!, and Una Hrnjak-Hadziahmetovic, sustainability and program manager at Gap Inc. Dozens of Miami students and faculty packed into Laws Hall to hear the distinguished speak about their time at Miami and how they found success after their undergraduate years. All of the women emphasized the importance of networking, especially in the media and communications industry. They advised students to create organic relationships with people they want to network with early on and to always search for a common thread with these people. In doing so, they mentioned LinkedIn as a great resource to find people to reach out to, whether it be directly or through a mutual connection. Palmer Graham also warned students not to underestimate the power of a hand-written letter in this digital age when communicating with potential employers. The audience listens to one of the panel member's comments. Pierre-Bravo, who is a millennial contributor to MSNBC newscaster Mika Brzezinski's "Know Your Value Campaign," is writing a book with Brzezinski that focuses on helping women in the workforce. Pierre-Bravo suggested that students use their angle as millennials to their advantage when selling themselves to potential employers by providing advice on where they believe the company could improve. "Own your career narrative," Pierre-Bravo said. "No one's going to hold your hand. You need to make a difference so people remember you." Kuhn's biggest piece of advice was finding a mentor. She said the reason she found her job at CNN is because her prior boss and mentor was hired there. Once he was hired, he brought Kuhn with him. 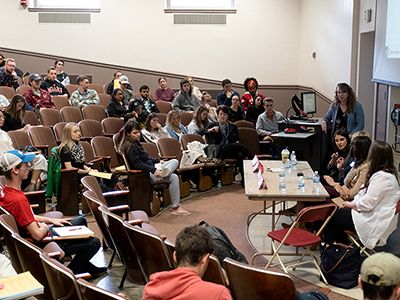 Hrnjak-Hadziahmetovic advised students to recognize how their involvement on campus and connections made at Miami can help them in their future careers. She was a member of Kappa Alpha Theta sorority during her time at Miami, and she got her first two jobs because of connections she made through the sorority. Palmer Graham encouraged Miami undergraduates to solidify their values before entering the workforce. She said that asking for help is something that many people believe is a weakness, but it has helped to advance her in her career. Junior professional writing major Claire Podges found the career tips to be surprisingly helpful, especially because she's applying for summer internships right now. "I never thought about half of the tips they gave us," she said. "Even though they're small details like branding your cover letter, I can see how they'd make a big difference."